I'm still using Office 2007 at work. The new UI is really growing on me and I find it easier to do things than in Office 2003. And I've been using Office since the early 1990s. But (you knew that was coming), I keep finding little things that are left out of Word 2007. The first was that Word 2007 no longer supports some early Word format files. Gimme a break. How much code could that have been? And it seems that they're even a little embarrassed about it. When you try to open one, you get a pop-up that says that that file type is blocked by policy. 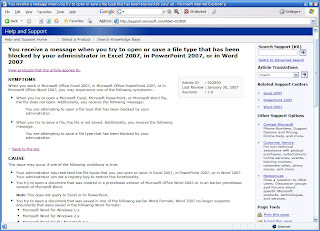 If you follow the link at the bottom, it takes you to a KnowledgeBase article that way down the page mentions that Word 2007 no longer supports Word 1.0 and Word 2.0 files. 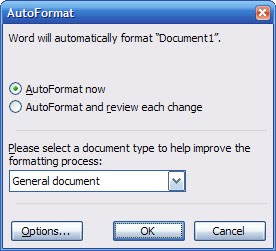 Then today, I realized that Word 2007 no longer supports AutoFormat in the menu system. If you don't know what that is, follow the following steps. I copied and pasted into Word 2003 some text with carriage returns at the end of each line. Then I went to the menu bar and selected Format. I selected AutoFormat and got this dialog. I just clicked on OK and voila! I couldn't figure how to do that in Word 2007. But read that page all the way to the end. 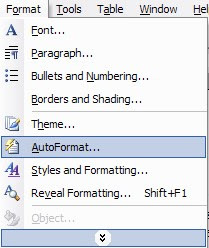 "In Word, you can add AutoFormat to the Quick Access Toolbar." Then they show you how to do that. I guess they couldn't find a place on the ribbon to add that feature. One last rant. Look at the screen shots in this earlier post. Notice that there's no Help search field in the menu bar. There is now a blank space where the search field used to be. Go figure. PS. I forgot this one. It really isn't just Word 2007 but that's where you'll use it most. 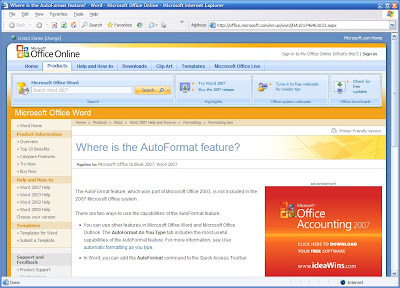 Office 2007 has an add-in that will let you create PDFs. You can download it here.